live with, rather than the kind which is commercialized as a show place." I find it hard to believe that IKWIG was once a buried gem and not standing, sparkling on a cinematic pedestal somewhere. Granted, it's probably the most blustery film you're ever likely to see (Scotland has rarely been so inviting on screen, Local Hero excepted. Ah, the wind, rain, rushing water and the highlands). But it's also timelessly romantic, impeccably acted and looks gorgeous (in its own 40s black and white pin sharpness way of course). IKWIG is 60 years old and tells of an ambitious woman setting off to marry a rich man and falling for another while she struggles to complete her journey. It's one of those movies that because of its age has not exactly nuzzled up to the Four Weddings and Notting Hills of this genre and staked a justified claim for membership in the rom-com club. The IMDB messages on the film are rather scant and scattershot. But, despite this lack of recognition, IKWIG is way up the list of the best of the Archers' work. It has a definable through line, a very specific narrative and a playful and experimental way of unfolding that narrative. 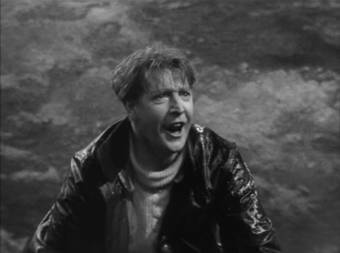 It also has Roger Livesey and his extraordinary voice. We have Wendy Hiller in a career defining performance and there is also one of my favourite entrances of any character in any movie. More on her and her rabbits in a moment. There is a playfulness apparent in IKWIG that – at this time in cinema's short life – could be found on very few occasions. Powell, simply put, is having a ball. Even the design of the front credits is original and surreal (the crew's names appear on props presented to the camera and P&P's appear wrought in metal on a cast iron gate clanged shut). Our heroine Joan is a woman with serious daddy issues. She's also utterly convinced that not only does she know her own mind, she should follow it regardless of what life throws at her (like the promise of romantic happiness, not a development to be avoided – usually). In the first scene, we are led to believe that the man she is meeting is romantically linked to her because of all the 'darling's being bandied about. But no. It's her father, good old bank manager dad giving her a small fortune to travel to Scotland to marry Berringer, a venture capitalist. In a rebuke, her father reminds her that Berringer is “nearly as old as me.” Joan flies back with “What's wrong with that?” It's almost as if she is making a swap, one salt of the earth father for a sugar daddy. In a masterful editing transition (it's not showy, it's just effortless), a wild, shadowy presence with two sodden and enormous hounds stops and looks back to her home (which must be quite a walk away). There's one very short cut of the expectant visitors and then for me the shot of the movie (and this is not to diss Erwin Hillier's terrific exterior photography). It's a low angle shot of those monstrous hounds walking towards us, their tails swinging up close to the lens, followed by the shadow herself, Catriona Potts, played by the utterly gorgeous Pamela Brown. Powell evidently thought so too as they fell in love on this shoot. Catriona is a woman both men and women admire and envy. Let's strip away any 21st century notions of beauty, obsessions with diets, body shape and size and get to the real thing. Here she is. And Joan knows it too. It's as if a force of nature just swept in and Joan has to acknowledge that this creature (whom you just know carpés every diem) is what a woman actually is. Yes, she shoots and skins rabbits to live off and perhaps that's not ladylike (whatever the hell that means) but this diminutive creature with wet scraggly hair, throwing her dead rabbit to the side as she sees Livesey and in that low voice bellows “Torquil!”, I defy you not to appreciate 'the real thing'. Just to empahsise my (and Powell's) passion for Pamela, check out the adoring close up of her at 01:00:11. To get to her soon-to-be husband (whom we know she will never reach), Joan uses the tools of her 'know-where-she's-going' world to force a young boatman out into the dangerous waters – cash. £20. It is the exact sum of money this young man needs to marry his sweetheart. 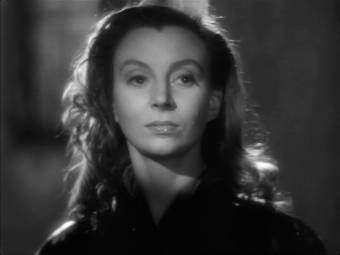 Pamela Brown (swoon), in a moment of chilling honesty, tells Livesey “It's you she's running away from…” and the lunkhead finally puts two and two together. He joins the fated boat crew and within moments they are headed, engineless, towards the dreaded whirlpool, the Corryvreckan. It is – because we care – a very tense moment despite the fact that the actors are very plainly in no peril and they are being rocked by burly British stagehands as the back projection provides the whirlpool imagery. Joan and Torquil survive and Catriona (Pamela – and I have done enough swooning) is gracious in Joan's total humiliation. The next day, the weather breaks and Joan can finally get to her intended leaving her true beloved. What happens next is truly marvelous. We have the couple saying goodbye in the most dizzying fashion and the curse, which Torquil (Livesey) has avoided all his life, is revealed to be something extraordinary. Love comes galloping back amid the ineffably romantic strains of bagpipes and a tear springs to one's eyes (OK,OK, my eyes, happy now?) as the lovers re-unite. Oh, just see this movie. It'll make you glad to be alive. Side Note: Powell said that he was proud of what he called 'the best special effect of my career' (and that's quite a boast given the movies on his CV) wreathed in and out of IKWIG. Livesey was under contract in a London play and could not actually go to Scotland during shooting. Anytime you see Torquil outdoors actually on location not in front of a projection, it is a cunningly directed body double and it fools me every time. The black and white transfer is very good and the lighting and contrast levels are such that you want to reach out and touch the principals. It really has been gloriously shot despite the process work (back and/or front projected backgrounds against which the actors are shot to suggest they are in a car, bus, on a boat etc.) In this case it's a bus and the process work is "Just mad, Ted." The highlands whiz by like Dennis Hopper's POV after a tab of acid. The Dolby Digital 2.0 sound does what it says on the tin. You can understand what's being said (unless it's in Gaelic). You may be able to speak Gaelic but for the dramatic purposes of the film, you shouldn't be able to. Needless to say, the subtitles don''t cover the Gaelic, inserting "They speak Gaelic" as a subtitle. Helpful. Nada. Zip. Nothing. Niente. Not a high fat, emulsified offal tube (a sausage to those who've not seen Jim Hacker elected to No. 10). But there are always Roger Livesey's teeth. I could stare at them for hours.